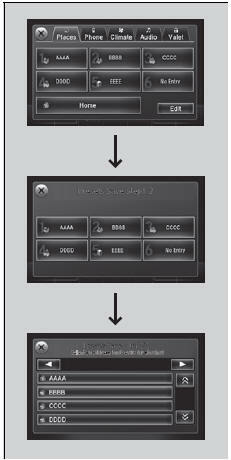 Use the On Demand Multi-Use DisplayTM to operate the audio system. 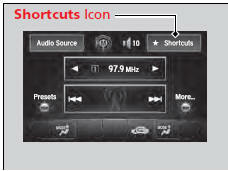 Select Audio Source, then select an icon on the source list to switch the audio source. You can preset the settings of four or three categories (Places*, Phone, Climate, Audio) from Shortcuts. The preset memory is cleared when it is disconnected from the power source, such as when the battery is disconnected or goes dead. You can store up to six addresses, and the home address for your preset destinations. To store an address on the selected preset number: 1. Select Shortcuts. 3. Select Edit or No Entry. - If you select No Entry, go to step 6. - All the six preset icons appear. 5. Select the preset number to which you want to store an address. 6. The screen changes to a list of addresses stored in your address book. 7. Select an address you want to store as a preset. To enter one of the preset addresses, or Home as your destination: 1. Select Shortcuts. 3. Select a preset number or Home. - The system starts to calculate the route to your selected destination. See the Navigation System Manual for how to store address book entries, and enter your home address. 5. Select the preset number with the destination you want to delete. 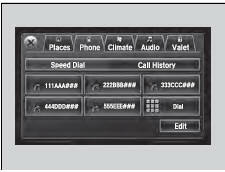 You can preset five speed dial entries, and make a call from one of the preset numbers, or call history when the phone is paired and connected to the vehicle‘s Bluetooth® HandsFreeLink® (HFL) system. To preset a speed dial: 1. Select Shortcuts. 4. Select Edit or No Entry. - Five presets appear. Select a No Entry preset or an existing preset. - The screen changes to a list of previously stored speed dial entries. 6. Select a number you want to store as a shortcut. To make a call from a speed dial entry: 1. Select Shortcuts. 4. Select a preset number. 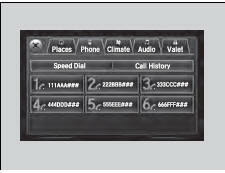 You can make a call using the keyboard on the On Demand Multi-Use DisplayTM to input numbers. To delete a speed dial: 1. Select Shortcuts. 6. Select the preset number with the phone number you want to delete. To make a call from call history: 1. Select Shortcuts. 4. Select a phone number. The call history displays the last six dialed, received, or missed calls. You can store two sets of your preferred temperature, fan speed, and vent mode settings to the climate control system. To store a set of the climate control settings: 1. Select Shortcuts. 2. Adjust the climate control system to your preference. 6. Select Preset 1 or Preset 2 you want to store your settings to. 3. Select Preset 1 or Preset 2. 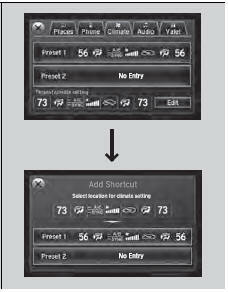 You can also store a set by pressing and holding the preset number you want to store that setting after step 3. 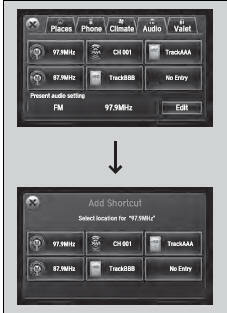 You can store up to six radio stations, and HDD audio album/play lists when playing AM, FM, or XM® radio, or HDD audio. 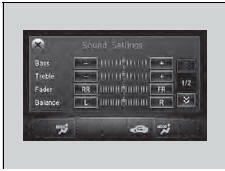 To preset a station or song: 1. Select Shortcuts. 2. Tune to a radio station or select a song from HDD audio. 6. Select the preset icon you want to store the station or song to. 3. Select a preset icon. You can also preset a station or song by pressing and holding the preset icon you want to store that station or song after step 3. 2. Use , or other icons to adjust the setting. Instead of using , or icons, you can also touch the point where your desired setting is. 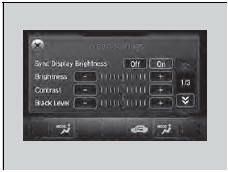 Selects whether the screen brightness synchronizes with the instruments panel brightness. Turns on and off the vibration when you touch the screen.